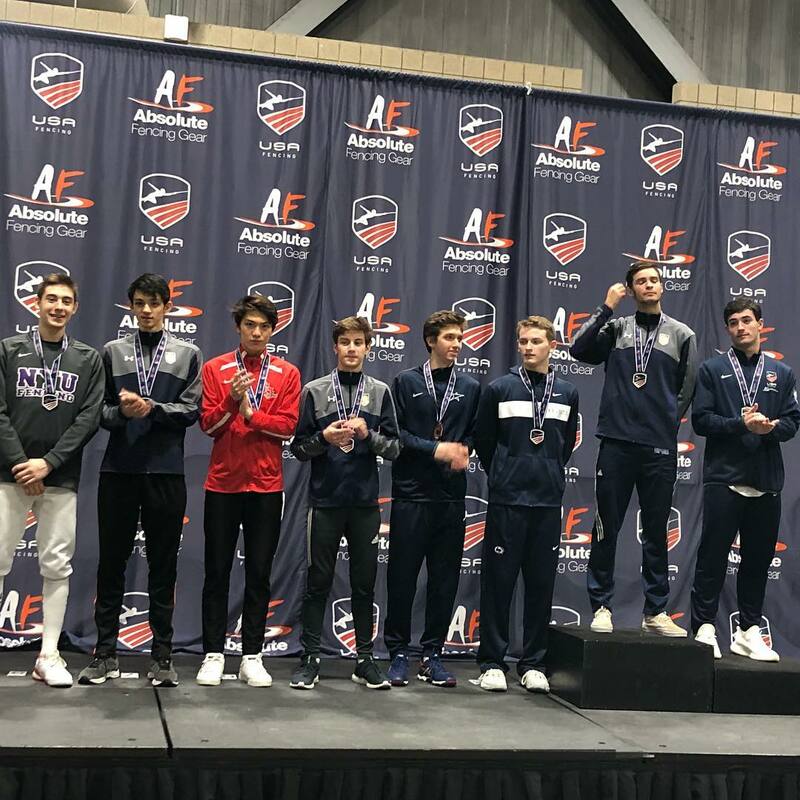 Brooklyn, NY (November 13, 2018) – Four teen fencers from Long Island and Brooklyn had success at the North American Cup in Kansas City, Missouri last weekend, earning gold, bronze, and top 8 medals, and strengthening their chances for selection to the US and Canadian national teams. 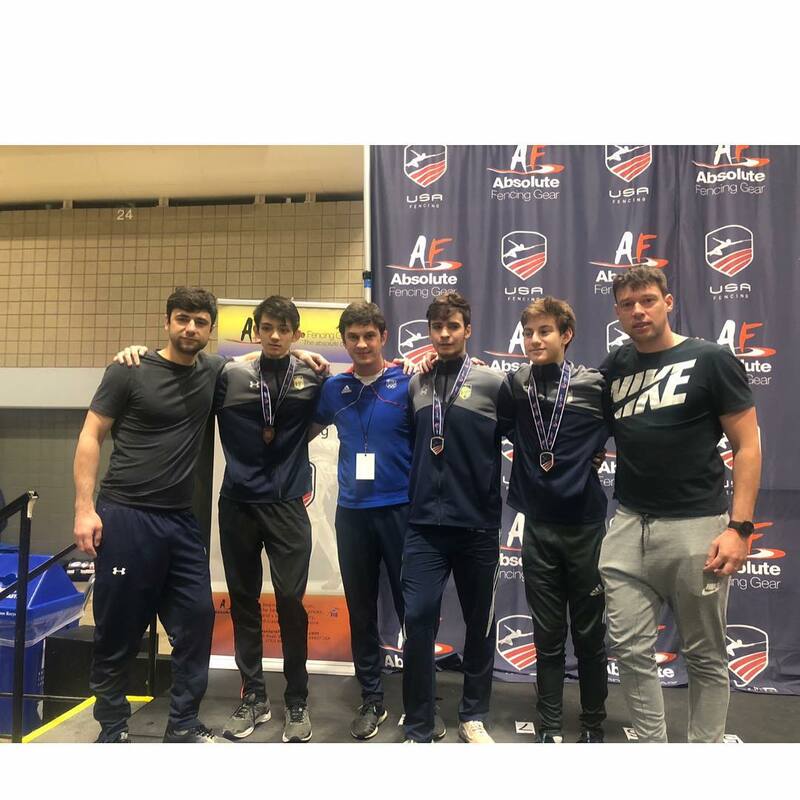 These athletes come from different high schools but train and travel together as clubmates at New York Fencing Academy, with one goal in common: to compete for their countries on the international stage. Skyler Liverant, a freshman at Brooklyn Prospect Charter High School, earned 5th place in Juniors, two categories above his age group. Now ranked number two nationally, Liverant has a good chance at making the US Cadet national team. His coach, Misha Mokretsov at New York Fencing Academy in Coney Island, Brooklyn, said, “Skyler is only 14 and was having a blast fencing some of the best 17-20 year olds in the country, so when he beat them, he was ecstatic.” Liverant’s highlight of the day was defeating Notre Dame’s Stephen Ewart, a 3-time national team member and Junior and Division 1 champion. Liverant will attempt to solidify his position at the Cadet Circuit in Bonn, Germany later this month. Alan Temiryaev, a senior at Hewlett High School who has verbally committed to Columbia University, won his second Junior national title last weekend. Temiryaev hopes to make the US Junior national team, and after a tough start to the season, was determined to have a strong showing. “I won my first four bouts, then twisted my ankle badly and lost the next two. But I’m glad I was able to overcome the pain and win” said Temiryaev. He had to defeat his clubmates, NYU fencer Sam Bekker, and Liverant, to go on to beat World Championship silver medalist, Ryan Griffiths, and Youth Olympics bronze medalist, Isaac Herbst, in the finals. Temiryaev will try to add to his winning record at the upcoming World Cups in Riga, Latvia and in Luxembourg. Jaclyn Khrol, sophomore at Midwood High School, showed great consistency, earning bronze in Juniors and top 8 in Cadets. Khrol is currently second in team points to make the US national team. In one week she will represent Team USA at the Junior World Cup in Puerto Rico, and then will join clubmate, Temiryaev, in Luxembourg. She is proud to have her little sister, Caralina Khrol, an 8th grader at Joseph B. Cavallaro Middle School, follow in her footsteps. Caralina also earned a bronze medal, in the under 14 age group. Steven Grams, Great Neck South High School senior, earned 7th place in Juniors. This was a comeback for Grams who lost almost the entire last season due to knee injuries, after starting off well with a silver and top 8 at last year’s Cadet NACs. “Now that he’s back, the first priority is to keep him healthy to train,” said his coach, Marat Israelian, at New York Fencing Academy in Port Washington, Long Island. “Hopefully this gives him the confidence to believe in his abilities. With practice, the sky’s the limit.” Grams will also compete in Luxembourg, and aims to secure a spot on the Canadian Junior national team. New York Fencing Academy (NYFA) was founded in 2010 in Brooklyn, NY by owner and head coach Misha Mokretsov. In 2018, NYFA opened their second location in Port Washington, Long Island, NY. NYFA is a center for excellence in epee, with one of the strongest competitive epee programs in the country. NYFA has produced National and World Champions, and has members on the USA and French national teams. NYFA provides private lessons, group classes, after school programs, and camps for students of all ages and all levels, beginners to advanced. Visit http://www.fencenyfa.com for more info. Brooklyn, NY (April 2, 2018) – First-time Junior World Championship Team member, 17-year-old, Alan Temiryaev, took 12th place in the individual epee competition on the first day of the Junior and Cadet World Championships in Verona, Italy. Temiryaev, a member of last year’s Cadet World Team, defeated Marin Atanasov (BUL), 15-11, and Fynn Fafard (CAN), 14-11, to advance to the 32. After easily taking the bout against Goncalo Alves (POR), 15-5, Temiryaev faced Davide Di Veroli (ITA), the 2017 Cadet World Champion. Temiryaev kept the bout close, but at 9-8, Di Veroli put up three straight single touches and used the momentum to win, 15-10. Di Veroli went on to claim the silver in the event. Temiryaev will be back in action on Monday as part of the Cadet World Team. Temiryaev is a student at New York Fencing Academy in Coney Island, Brooklyn, NY. He has been training with Coach Misha Mokretsov since he began fencing at age 10. New York Fencing Academy (NYFA) was founded in 2010 by owner and head coach Misha Mokretsov and is located in the Coney Island neighborhood of Brooklyn, NY. NYFA has quickly become a center for excellence in epee, with one of the strongest competitive epee programs in the country. 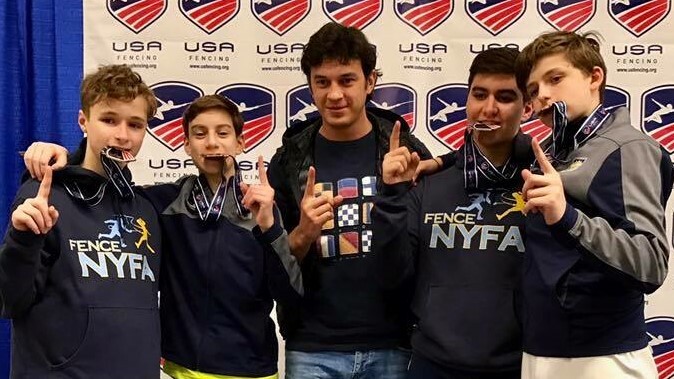 NYFA has been ranked #1 in youth epee and Fencing Club of the Year by National Fencing Club Rankings, and has produced National and World Champions, and has members on the USA cadet and junior national teams and French junior national team. NYFA provides private lessons, group classes, day camps, and the biggest Summer epee camp in the US. Visit http://www.fencenyfa.com for more info. 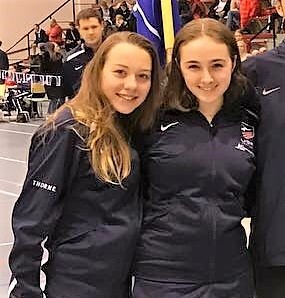 Brooklyn, NY (November 20, 2017) – New York Fencing Academy (NYFA) qualified five fencers — two boys and three girls — to represent Team USA at the Cadet World Cup in Espoo, Finland last week, where over 280 athletes from more than 25 countries competed. 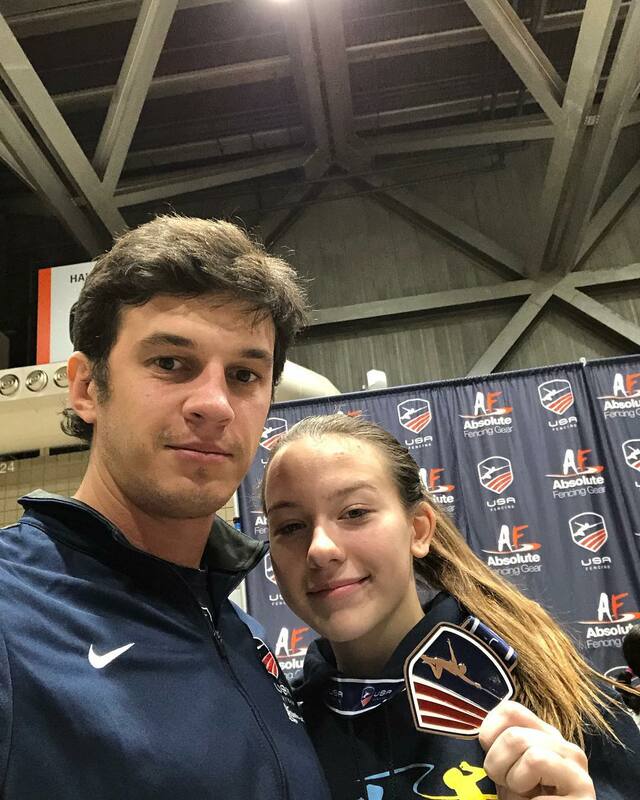 Only 20 of the best American athletes in the Cadet category (under 17 years old) may participate in world cups. As the second of three world cups this season, the Espoo competition was an essential step towards qualification for the World Championships in Verona, Italy next April. 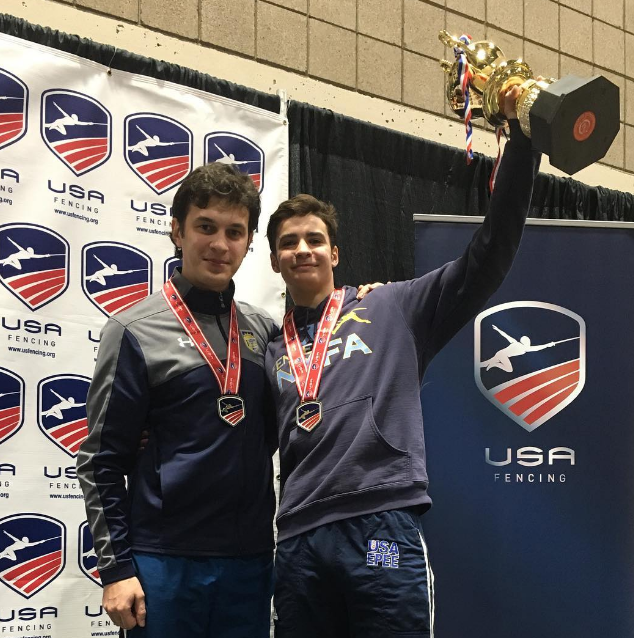 In the men’s epee competition, Alan Temiryaev (George W Hewlett High School), who competed in last year’s World Championship, began the day as number one seed and went 5-1 in the preliminary round. His clubmate, Ethan Kushnerik (Mill Basin, York Prep School) went 4-2. For the first bout in direct elimination, Temiryaev fenced Jaron Kiiroja from Estonia with a decisive victory scoring 15-9. Kushnerik fenced Yelnur Tulegenov from Kazakhstan and won 15-11. In the next bout, Kushnerik was stronger than Henrik Priimagi from Estonia, winning 15-8. To make top 16, Temiryaev had to face Matias Kallio from Finland. In a close bout, Temiryaev won 12-10. Kushnerik faced one of the top US fencers, Harrison Kimatian. Despite the fact that Kimatian is older and more experienced, 14-year-old Kushnerik was the victor with a score of 15-11. Both NYFA boys won their next bouts and made top 8. Kushernik beat another US fencer, Jared Felker, and Temiryaev bested US fencer Tristan Szapary. To make top 4, Kushnerik fenced Great Britain’s Luke Mason. Kushnerik lost by one touch, 14-15. Nevertheless, it is the best result for Kushnerik, who was one of the youngest participants in Espoo. Temiryaev moved forward and in a dramatic bout in overtime, beat Benjamin Dahlbo from Norway 7-6. The next bout would determine who made the finals. Temiryaev faced US athlete Jonas Hansen from Boston. They know each other well and just four days earlier, they fenced in the North American Cup, where Temiryaev won by one touch in overtime. This time he won again, with a comfortable score of 15-10. The final bout was also against a US teammate, Isaak Herbst. Temiryaev started weak and was down 7-1. He made a huge come back to 10-10, but in overtime, lost 10-11. Temiryaev earned the silver medal and Kushnerik took 7th place out of 141 fencers. Three NYFA girls also represented Team USA, demonstrating the growing strength of the club’s female team. Jaclyn Khrol (Bensonhurst, Midwood High School), Melanie Dolgonos (Mill Basin, James Madison High School), and Anna Lanzman (Mill Basin, Stuyvesant High School) had a fun but challenging day of competition. In the preliminary round, Khrol was undefeated at 6-0, Dolgonos went 1-5, and Lanzman went 3-3. In direct elimination, Lanzman lost her first bout to Marta Dobkevica from Latvia. Lanzman was disadvantaged when her fencing bag was lost by the airline. 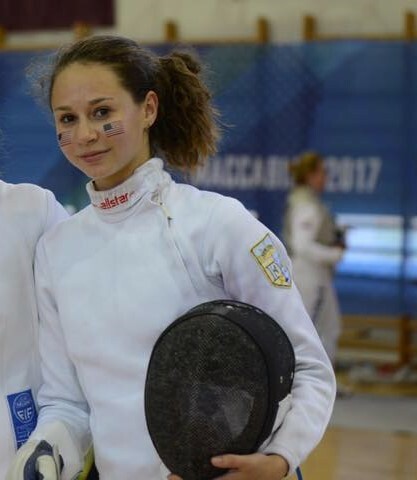 In these instances, fencers will borrow from teammates, but it can be difficult since all equipment is custom fitted and built for each athlete. Dolgonos faced a tough opponent in her first bout to make top 64, but won 10-8 after Jacqueline Oien from Great Britain dislocated her knee and had to withdraw. In the bout for top 32, Dolgonos fenced Sara Della Cioppa from Italy and won with a strong 15-9 score. For top 16, Dolgonos lost to US fencer, Mina Yamanaka. The best result was earned by Khrol, who also was one of the youngest fencers at the competition. After going undefeated in pools, Khrol continued to dominate and won her first direct elimination bout 15-6 against Lizaveta Zaretskaya from Belarus. To make top 16, Khrol had a confident victory over Eleanor Taylor from Great Britain at 15-11. The next bout wasn’t as smooth, as Khrol was losing 2-6, but managed to turn it around and win 15-10 against Hanna Lipthay from Hungary. To make top 4, Khrol had to face the previous World Cup winner and US fencer, Claire Beddingfield. Khrol was winning 12-10, then with only 10 seconds left, Beddingfield scored a touch. With four seconds remaining, Beddingfield scored again in the last second but it was outside of the fencing strip. The referee didn’t see the violation and awarded the touch. In overtime. Khrol lost 12-13, one touch short of the bronze medal. At just 14 years old, Khrol earned an impressive 5th place in a Cadet World Cup, Dolgonos made top 32, and Lanzman finished 77th out of 140. Our athletes will be back in action at the North American Cup in Portland, Oregon in December. New York Fencing Academy (NYFA) was founded in 2010 by owner and head coach Misha Mokretsov and is located in the Coney Island neighborhood of Brooklyn, NY. NYFA has quickly become a center for excellence in epee, with one of the strongest competitive epee programs in the country. NYFA has already produced National and World Champions, and has members on the USA cadet national team and French junior national team. NYFA provides private lessons, group classes, and camps for students of all ages and all levels, beginners to advanced. Visit http://www.fencenyfa.com for more info. Brooklyn, NY (February 23, 2017) – Alan Temiryaev, a sophomore at James Madison High School in Brooklyn, NY, won gold in the Junior Olympics in Kansas City, Missouri last weekend. This final competition of the season earned Temiryaev a National Championship medal and locked up his spot on the USA National Team to compete in the World Championships. Temiryaev had a very strong season, including two bronze medals at World Cups in Austria and France. At just 16 years old, he is one of the youngest to win the Junior (under-20) age category at the Junior Olympics, which also includes a Cadet (under-17) competition. This year, the Junior Olympics had a record breaking number of athletes with 301 participating in the Junior event, including reigning World Champion, Sean Wilson, from Houston, Texas. In the preliminary round, Temiryaev scored five wins and one loss. In direct eliminations, he won against Syed Haider to make top 128, then scored 15-6 against New Jersey fencer, Finn Miller to make top 64. The next bout for top 32 was very tough since Temiryaev had to face a USA Junior National Team anchor, Wesley Johnson. Temiryaev took an early lead of 9-4 and never let Johnson make a come back. He won 15-9. For top 16, Temiryaev faced another very experienced fencer from Colorado, Henry Lange. Down 10-13, Temiryaev managed to pull off a skillful combination of touches and won 15-14. For the medal round, Temiryaev was up against his New York Fencing Academy clubmate, Nathan Vaysberg. It is always hard for clubmates to compete because they know each other very well, but this time Temiryaev was stronger and won 15-8. To make semifinals, Temiryaev confidently won against Harrison Kimatian, 15-8. Next, he faced a very strong contender, Isaac Herbst from Houston, Texas, who was competing for a National Team spot with Temiryaev for World Team. There are only three spots each year to make National Team. Temiryaev was unstoppable in this bout, making almost no mistakes, and winning 15-6. In the bout for gold, Temiryaev faced a very experienced fencer from Columbia University, Mick Yamanaka. After a long day of competition, both athletes were very tired and had little energy left, so it was a battle of strategy and willpower. Temiryaev started off losing and couldn’t catch up — until the end of the bout. With 20 seconds left and trailing 4-6, Temiryaev scored two points to tie at 6-6. In overtime. the fencers had one minute to score one point for the win. The referee flips a coin to determine who has priority and the fencer with priority wins if one minute passes with no touches scored. Temiryaev got priority, so Yamanaka had to attack, but while he was preparing to attack, Temiryaev made his own attack. Yamanaka wasn’t ready and lost the touch. With a score of 7-6, Alan Temiryaev became the Junior Olympic Champion in junior men’s epee. Temiryaev has been selected for the USA World Team and will travel with his coach, Misha Mokretsov, to compete at the World Championships in Plovdiv, Bulgaria which will be held April 1-10. New York Fencing Academy (NYFA) was founded in 2010 by owner and head coach Misha Mokretsov and is located in the Coney Island neighborhood of Brooklyn, NY. NYFA has quickly become a center for excellence in epee, with one of the strongest competitive epee programs in the country. NYFA has already produced National and World Champions, and has members on the French junior national team and the USA cadet national team. NYFA provides private lessons, group classes, and camps for students of all ages and all levels, beginners to advanced. Visit http://www.fencenyfa.com for more info.